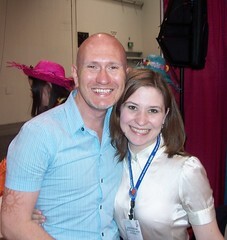 Sunday while here at ALA in Anaheim, CA, I finally met Megan McFarlane from ALA’s Office in Chicago. Megan and I have been in correspondence for what seems like a year now, talking by phone and email about the various components of the http://www.circleofknowledge.wordpress.com . Though I feel like Megan and I know each other as if we were long-time office mates, we’d never actually seen one another in person until the Campaign for America’s Libraries program on Sunday. There really are endless possibilities for partnership, collaboration and dreaming (and doing) in libraries! Cheers to Megan and all those who help make the Library–in all its forms–shine BIG every day!